MMatty Harris is a music producer, mixing and mastering engineer from Boston, now based in LA. After touring with bands as a drummer as early as at the age of 14, he studied Music Production and Engineering at Berklee College of Music. Since then, he has worked on numerous records for Atlantic, RCA, WB, Sammy Adams, A$AP Rocky, and many more. He worked on the Grammy Award-winning song “Stronger” by Kelly Clarkson and won the 2008 Boston Music Award for Best Hip-Hop Engineer and Producer. 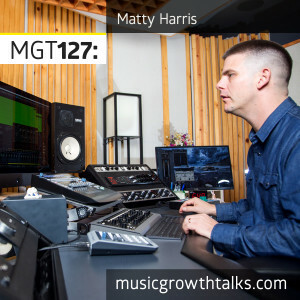 On this Music Growth Talks episode, Matty talked about a range of topics, from singles taking over albums and who to have in your music team, to “wah wah west” and avoiding the common mistakes a lot of DIY musicians make when recording at home. Listen to the podcast in full to also learn about trends in mastering music for streaming platforms, and to discover the “hidden” benefit of hiring a professional to help you finish a song.